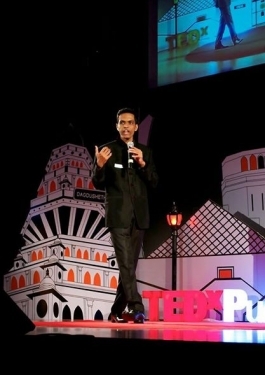 Interview with Abhishek Suryawanshi, a young lad from Pune who is the founder at Wikipedia Pune, TEDxPune and is inspiring people to live a better life. The youngster who hails from Solapur is a scientist, a social worker, curator and licensee for TEDxPune, Campus Ambassador for Wikipedia and International Student Ambassador for Youthistan. He is Abhishek Suryawanshi. I have known Abhishek for a while now due to the initiatives he has successfully pulled out in Pune over the last few years. However, this was my first extensive meeting with him, a day before he boarded the US flight. Dressed in a black hoodie, carrying a big backpack and headphones attached, the tall and lean guy walked towards me to say a hello just outside the cafe. While we were taking our seats, Abhishek excitedly revealed that before coming to meet me he was getting his new visiting cards done. The new card highlighted that he is now the Vice President, Wikimedia, New York City. These are the good days that have just begun to open up their doors. The hero’s story starts with his birth, a chronic disease convinced doctors that the child wouldn’t live long. “My childhood wasn’t a normal one, I was diagnosed with a serious asthma problem and many a times faced strong asthma attacks,” shared Abhishek while sipping his coffee and recollecting his childhood days. Life changed for Abhishek at 14 when he completely recovered from his health problems. As a kid, Abhishek was quite attached to nature but at the same time coming from a rural background made him aware of the water scarcity problem. This method when implemented saves 1/10th of water as compared to other methods including Drip Irrigation and Sprinkler Irrigation. “Suction Method of Irrigation requires only brick and pipe as essential tools. Thus, it’s much cheaper than the traditional methods which require a lot of instrumentation and electricity,” informed Abhishek. Later he presented his research work at National Children Science Congress (2004) held at Guwahati led by the then President Hon.Dr. APJ Abdul Kalam. Abhishek not only received a good response and awards at the event but his meeting with Kalam was a life changing movement. His research work also got him selected from Maharashtra State for Hum Honge Kaamyab, T.V. Series for young scientists. In 2005, his research work was also recognized by the Maharashtra Government but then it came after tough convincing by the young scientist. The state level irrigation conference organized by the government was only for Post Graduates and PhDs, Abhishek was still in the 9th standard so he was refused to showcase his work. “I requested them to give me a slot to show and represent my idea, so that other scholars may pick up as their research subject and also provide their views on my work,” he recollected. The research work not only got heard but the judges were so impressed by Abhishek’s idea that they gave him a cash prize from their pocket as his entry was not among the entries competing for the cash-prize. Suction Method of Irrigation today has been implemented at some places in Solapur but hasn’t got its due. Lack of government support, lobby of agriculture companies and orthodox ways of farming have been the major reasons for curtailing the growth of the project. TED talks have been an inspiration for Abhishek and he has spent hours watching and listening to great personalities on the program. In 2009 when TED came to India, Abhishek applied for a fellowship. He got rejected due to his age but TED was launching TEDx for which they asked his help. This led to the beginning of the relationship and in 2010 TEDxPune happened which was a success. This motivated Abhishek to take the inspiring TED videos to the under privileged communities who have been left behind by society. This led to the beginning of TEDxPune for the under privileged people and seeing this initiative Gates Foundation came forward to bear the required costs. Over the time Abhishek has worked closely with Wikipedia to set up its base, educate students about it and promote its use in all 21 regional languages. Meanwhile, Gates Foundation, impressed by Abhishek provided him a scholarship to attend a TED conference in US. However, the dream to fly to the US was met with a big jolt since his visa was rejected not once but thrice. Finally after Hillary Clinton wrote a letter to the US Consulate after Gates Foundation requested, Abhishek was granted a 10 year multiple business visa. While the dream to fly to the US became a reality for him, this also unknowingly, opened up another door for him. The US Consulate India was quite curious to meet him and find out what did he do to have Hillary Clinton request for a US visa for him. Last year Abhishek got the chance to visit NASA to interact with young scientists and later on visited Sudan. Today Abhishek’s urge to live and do well for society has motivated him to go places and share platforms with enlightened minds. In this journey so far, he gives due credit to the Pune educational institutes who have not only supported but given the much required help for all his events and workshops. In fact during the Wikipedia event in Pune, Facebook was of great help for the promotions along with the local digital agencies in Pune known to him personally. “It is the WHY that has motivated people to come and join hands with me,” said Abhishek before leaving me awestruck with his journey so far. While Abhishek categorically denied that he is a real life hero but I think this is how a real life hero is, they focus on the WHY rather than the HOW and WHAT.